Whew! It’s been a busy week following a very busy and very happy weekend last weekend. For those who didn’t know, hadn’t heard, last weekend was our big biannual (maybe that’s semiannual) quilt show with participation from a WHOLE lot of quilt guilds. I think I read 15 guilds. Anyway, it was tireless work and planning and thinking ahead to make the quilt show a success! We had several nationally known speakers come to the show to teach (and to take) classes, a lot of them are in the local KC area. I forget sometimes what an essential asset we have in our wonderful teachers and vendors to our larger community. Arriving on the main show floor at the top of the long escalators, we see a quilt completed by one of the major quilt planners. This quilt was done by Lynn Droege was beautiful under glass and a great way to entice people to go into the hall. I have so many memories of my experiences of the show, I am going to try to write them down for posterity. This post will have LOTS of writing, the next post may have LOTS of pictures in addition to LOTS of writing. The Too Long;Didn’t Read version is: I had a lot of fun, met people I knew, people I didn’t know, felt happy, show went well. The first hallway before the main quilting area was the individual guild booths. This was our main moneymaker for the year, and all the last year we have been making items to sell at the boutique. My guild had lots of different types of items for sale, kinda like a craft show. Several guilds had opportunity quilts. I somehow failed to get pictures of our guild booth, or the general front hall with all the guilds, even though each day I was blessed to see people from my guild and others. Then a right hand turn and either with a ticket or a bracelet we could get into the show itself! Immediately when we come into the hall, there is a door prize ticket booth on the left. The far left-handed side were all the guild quilts that were not judged. There were 2 full rows (each side) of quilts here. About 500 quilts on this side. Directly in the middle were the vendors. Several rows of vendors. And to the right-handed side coming into the show room were the judged quilts. About 150 quilts or so here if my math is right. I was able to be at the show the 3 days of the festival itself. There was one other day of classes I did not attend. AND there was a special room of 3 special exhibits that weren’t part of the main hall, down on the first floor, there were Beatles quilts by a group of quilters in Virginia, and Kansas City Star quilts (a main reason this is a great quilting hotspot), and some of the best quilts from QuiltCon. So much to tell! I may break it up by days instead of break it up by types of things seen like Kathy did. Friday was unfortunate in that I had to work, but as soon as I got done at noon, I drove past the scary construction on the scary interstate to the show. I had the “pockets of awesome” or on Friday, the “pockets of no charge”. I had my old phone which had all the phone numbers and access to data and was going to be my main connectivity with the twilters I was set to meetup with. I also had my normal camera, the one that has been taking all these pictures for this blog since like 2012. And I had my brand new phone, not really setup yet. And a cable to charge all the things. At one time I had both phones outta charge. Silly technology. Ok. First thing I did after entering the show was to find Carole’s quilt – I See Bridges. And I took a picture of me in front of it. I tried to make a joke about how I saw bridges and I saw Carole’s quilt, but I didn’t see any twilters. Unfortunately, Carole & Gretchen had plans to come to the show and neither one was able to make it. Carole’s quilt was about the only judged quilt I saw from anywhere not in the KC region, which I found very fantastic for her to enter the show that way. It was really unfortunate that she wasn’t able to see it in person. I was starting to get nervous because the phone with the texts was notorious for dropping almost half available battery in half an hour, and I knew I would have to periodically check twitter and email on this very unreliable phone. I think I was walking around for almost an hour back and forth before I saw anyone. Luckily Jackie and I were able to text. I stayed in the back of the show before I met up with anyone just to “stay in a central place”. I forgot how much I don’t have to wait for people on a regular day. Jackie & I met up, walked the vendors really quickly, and then got in touch with Joyce, who follows Sandy at Quilting for the Rest of Us who also wasn’t able to attend the show. Joyce was with her friend Linda who was in the area, and Joyce and Linda were delightful to meet, even though she was not on twitter, and didn’t really know us, didn’t officially consider herself a twilter. Just after we met Joyce, another friendly face, Valerie, showed up and introduced herself to our group, recognizing one of us, probably Jackie. This was when Linda took a picture of us twilters and Joyce Friday afternoon. At this point, we walked around and talked a little bit. I met one of our local guild members (also named Sandy – I think I know like 5 quilting Sandys), the one who quilted my red & black King’s Puzzle Quilt, and we had another long conversation, while Valerie & Jackie had things to do. I got a cool idea of a suggestion of a collaboration with Tami since her round with all the folds was really fantastic on my quilt and her & I may be a good compliment. And just as the local Sandy left, I was able to locate Tami! At this point, my phone situation was really getting desperate, my charge was like zero on both phones. I was seeing the people who were important for me to see, in addition of stopping by local people who I also kept seeing and they kept saying nice things about my quilt on the judged side of the show. It was also nice to sit and talk with people I know that did a lot of work for the show and just enjoying the show in general! Tami & I had a small intimate discussion right there near the front door of the hall, probably in everyone’s way, but you know what, I didn’t care. I never exactly told Tami that I officially put my quilt Twilter’s Entwined in the show. I was so worried that I had jinxed it out of the show. Here’s the short story of that. The round robins were due back in Feb, and Feb our guild voted on quilts to put into the show. The day our guild was voting, I had no energy, I had had a crappy day, I was burnt out doing all the work on Diane’s round robin, and so I brought nothing to add to quilts for my guild for the show. I didn’t have my round robin quilt anyway, and I know how long it takes for ME to go from top to quilt — LONG time usually. Anyway, it was at our Feb guild retreat (after the voting) that we heard of several twilters going to try to come down for the Kansas City Show, thanks in particular to Sandy from QFTRUS really encouraging people to consider a meetup. At the retreat, I finished the red & black quilt, and guild members said I should try to get it into the show, so Royal Red King’s Puzzle, I arranged to have it quilted in time to enter for the judged section (guild section was closed already, or so I thought). That was my very first long-arm purchasing interaction I have ever had. Anyway, all the deadlines for the show had come & gone March 31st. I received my round robin quilt early April. A week later, there was a frantic email from our president saying ‘oops, we have more space than we thought’. Later the email said, ‘we can add more quilts, but the catch is that I have to know by 6PM on Friday (the day I am reading this is the same Friday)’. So I thought I could include Dancing Ribbons, sent off an email and then driving to work started thinking. So I put a post on twitter, tagged Jackie and a few other people maybe, and waited to see the response. I had massive emails/texts/twitter messages back & forth. I tell you it was nuts. I first thought for certain I could get both quilts in, emailing back the guild president, I met up with Jackie after work, showed her the pictures, we had already setup a sew-in date for early May, so would she be available to quilt it? YES?! PERFECT! I was bouncing up & down the walls, not believing my good fortune. Tami did the round on the quilt and she was going to be here to see it and be a part of it hanging in the show. And another twilter was quilting it. Amazing! Things fell into place. I was joyous, I was obnoxious with happy, I was just so incredibly amazed and just feeling absolutely great! Then later that night, they said there wasn’t enough space for the “medium-large sized” Twilters Entwined quilt. Embarrassed at my overreaction about how things just seemed to work for the quilt. I was pretty much in tears that night. Mostly from embarrassment at myself and how I wasn’t keeping everything into perspective. Fortunately, the next morning the guild president called me and told me that they were looking/talking with one of the coordinators, and somehow there was actually more space. I am not sure how that happened or if it was a result of me going overboard, or just miscalculation, or something else occurring somewhere. But after that, I put in my paperwork, but wasn’t fully convinced it was going into the show until I turned my quilts in with the rest of our guild the meeting Tuesday before the show. So Tami said she had seen my little Dancing Ribbons quilt in the show, was looking at it with I think Kathy earlier that day before I got here, turned her head to the side, and then saw the pink and purple quilt of my last story, Twilter’s Entwined. And she said she was floored. I really was excited for the fact that she may not know the quilt was there, I thought it was a nice surprise for her. This picture is Tami in front of Twilter’s Entwined. I think taken by Kathy. Before I got there. Anyway, while talking to Tami, Kathy came along and we talked about her love of Angela Walters, her love of blogging and how I love her quilt memes and blog posts are always so funny! And we kept standing right there at the beginning of the show. Kathy did get a picture of her by my Royal Red King’s Puzzle quilt. Taken by Tami maybe. Before I got there. Kathy looks great in front of my quilt, right? We broke up as a small group in the late afternoon, with our prearranged meetup place & time – Joe’s Kansas City barbeque, which was like one “block” over from the convention center. During the time in between out-of-town twilters, I went back to the bag check area, found a plug in for my navigation phone so at least I could figure out what side of the road Joes was on exactly. I chatted and laughed and laughed with our bag check ladies from our guild, another from another guild, and I sat in the spot of the 3rd. We constantly talked about how well the show seemed to be doing, how the people at bag check in the morning saw packed lines going up & down the escalator, how parking was a nightmare, and another lady from our guild saw me and asked if I knew I was working Saturday for the boutique. What’s with this Saturday thing? This had started to become a running joke with me, in addition to another embarrassing situation I put myself in due to a horrible typo. And finally by now, I had seen my twilters, so if nothing else, working Saturday wouldn’t be an issue for me since we were now able to meet on Friday night instead of Saturday morning. I was originally signed up to do two volunteer sessions for the show. One for the ‘show itself’, and one for the ‘guild’. One of these I actually DID sign up for Saturday morning, before the Twilter’s had looked at schedules and decided that maybe Saturday breakfast was going to be our only shot at everyone getting together at once. The only time we were originally were going to meet was Saturday. This was the “Original Plan”. A few days later, I asked both groups to make sure I wasn’t volunteering Saturday morning, I would just switch and then it would be easier and I wouldn’t miss the meetup. Well, you know how many different versions of schedules get floated around, and how we all think we’re making a change, and somehow it doesn’t stick? Well, somehow both groups put me on Saturday morning, there was more going on, but the 2nd time it happened, (planning stages here), I was starting to get worried that things wouldn’t work out. I asked a 2nd time to make sure I wasn’t volunteering on Saturday … there were emails, and a very large typo. And it was embarrassing. And teeny tiny bit funny, once the hurt feelings from the typo were straightened out. Once I knew we were meeting Friday night instead, that eased my worries a little, because no one had accidentally put me down for volunteering on Friday. Thank goodness for Jackie pulling together the spreadsheet with our times on it and noticing the date /time was available. But that hadn’t been planned until a week/few days before the show. Good thing too, because we were getting the idea no one in particular was looking forward to a really early morning meetup for breakfast (except for maybe me). I was just “so sure” that I would get volunteered Saturday by one or both groups I signed up to help, and that I would completely “miss out” on the meetup with everyone all in one place. I did get myself worked up for a while, imagining being “this close” to something I really wanted, and not being able to have it…. So on Friday of the show when I was told I was working Saturday, I burst out laughing. Mainly because of our other arrangements, also how silly it was to think how hard I was fighting not working Saturday. But now Saturday morning was MINE – FREE. I decided to come early Saturday & make sure the one group didn’t actually NEED me to be here – a little family issues & trying to interpret someone else’s chart made it possible that I would need to help out on Saturday. Me waiting for the show on Saturday, reading this diagram of classes (below). At 6PM I pulled up to Joe’s, met with Valerie and Steve, then Jackie & Greg showed up, then Kathy & Cliff drove up with Tami. I had heard great things about Joe’s, but mostly I heard about the fact it used to be called Oklahoma Joe’s and they changed the name to Joe’s Kansas City instead. And I heard the food was really good. I think the last time I had eaten it was like 10 years ago when I first moved to the area at a work function. It was a “go up and order” your food and then sit down with a table once you got it kind of place. And I put myself in the front of the line. I was tired, excited, elated, happy…. exhausted, talking a lot … on my feet for hours and hours and hours Friday. Luck was on my side when we got through the line, it was busy, and I wasn’t sure we were going to get to sit together, and oh boy, now I would somehow have to figure out how to arrange a seat. And then, a seat magically appeared. Large table with space for everyone! YAY. More quilt magic occurring. Yes, the things I worry about. So we got to sit together at Joe’s KC after the #KCRQF. I didn’t realize that it was guys on one side + Kathy, and girls on the other. But there was a Royals game on that the guys could watch. Kathy had saw the Beatles quilts down on the main floor. She seemed to really enjoy them! Kathy mentioned that she attended Quilt Con and she thought that this show, put together by GUILDS (not a quilt company) was super well run, seemed to work really smoothly, things seemed mostly on the top of their game. It was impressive about what we did. Luckily, there are enough guilds in the area that can help out with a show like this one to have the manpower to have the crowds we were talking here. I may have lost some other parts of conversations, but soon, we were getting our “twilter meetup” picture and I was driving myself home. Twilters agreed to try to meetup for Lunch the next day who all was here. And that is another day, and another story, and hopefully more pictures, in another blog post. And I don’t know exactly when it will be written/posted. This story so far has taken me a lot of the afternoon. Probably why I was putting it off. So much to tell. And tell and tell. I don’t want to forget my fun & fantastic weekend, so I will be back hopefully soon with more details for you to share in my experience! 36.6 I am Planning on Entering Kings Puzzle quilt in a Regional Show! Hey everyone! Long time no see here. I have been working on projects for others. Until 2 weeks ago, I went to a retreat, and I finally finished up the borders on my Royal Red Kings Puzzle quilt. And I have a great picture of it. Okay, still slanted, but I may have actually gotten the reds & greys close to accurate — do you know how hard it is to photograph such a graphic quilt? Anyway, there is a regional show here in Kansas City. 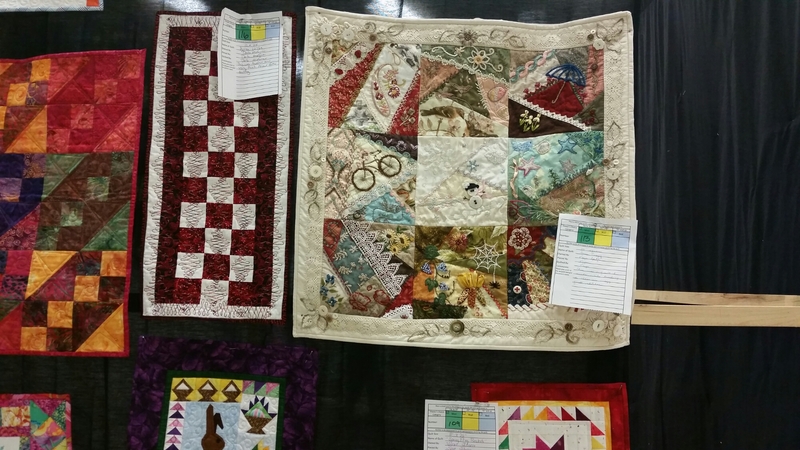 The Kansas City Regional Quilt Festival. I was tired of deadlines and not wanting to think about the quilt show, so I bailed for the guild selection of quilts. However, after I brought this beauty out at the guild retreat, I had more than one person come up & tell me this quilt needed to be entered. The show for judged quilts is first come, first served, it is not juried. There are also guild entries that each guild selects to represent their guilds. I was hesitant when we decided to vote on quilts for the guild, but now I am sticking my neck out there wider & getting this quilt judged! AS long as it makes it in time. I am heading to fill out the form right now, as soon as I am done with this post. First day for postmark on the quilts is tomorrow, so hopefully the mail here won’t be too slow for my entry to show up late at the headquarters. We do have a slow mail system, but I can’t mail it until Monday afternoon. Anyway, for those of you keeping reference, the pattern of the center of this quilt is called King’s Puzzle, made by Lois Hatleberg. I contacted her and she is fine with me putting this quilt in the show. And since I had all the extra dark reds I collected to find the last border, I pieced the backing into also a square. I tried to go from light to dark, inside to out. This quilt will be the first one that I don’t do start to finish. I know I could figure out & work through quilting this quilt on my own, but since I want some form of custom work on this quilt, and I don’t own a long arm, and it takes me enough time loading & unloading when I rent the long arm, that I would get frazzled doing this sort of work in a shop where everyone could see me. So I am reaching out to Artfully Quilted by Sandy Morgan Cockrum to quilt this quilt. We’re meeting to discuss next week. Here’s hoping that meeting goes as planned on both sides. She does amazing work and may work well for this “modern style” quilt. I do have to figure out what category this is going into. Maybe modern? There aren’t many categories. The show is also making me extra excited because several #twilter friends are going to come & make a special trip for a meetup! What a great day when I found out they were coming! If you’re coming, buy tickets through the website rather than in person if you can. Or I assume you can contact me & I can get you the tickets myself once I have them to sell. Looking forward to it. Maybe I’ll see YOU there! And if so, maybe you’ll see MY quilt? I hope so! This quilt I decided to remake. If you are a regular follower of my blog (and previous podcast) you may have heard / seen this quilt before. I am getting really close to being done with this quilt, now is all the handwork portion of the quilt left. The steps I still have left for this quilt are: one side of binding, hand tacking the sleeve to the back, sewing the label to the back, sewing the beads on at the appropriate parts. I took the quilt outside today and pretended that all four binding sections were sewn down. Let me back up a little bit and show you some process. Since I am a process girl. Last picture you have seen (according to my notes) was just before the completed corners were sewn onto the quilt. Well yes, you saw it sewn down with the batting and all, but there were some skipped steps on that silent sunday. I took apart this quilt, ripped off the binding, sewed together the paper pieced corners with the gold diamonds in the corners. Then I sewed the sashing directly onto the corners, I oversewed on the edges, figuring it would all square up at a later time. Probably dangerous to my final project, but in the end it worked. I don’t know that I recommend this method for other people, it very much uses the “fly by the seat of your pants” method of sew it bigger and then chop it down later instead of accurate measuring and calculating. And I repeated this for all four corners. I found the center of my corner blocks and the center of my quilt edge – see the pins on the right and left, those are center – centering pins to help me line up. As you can see, I decided to do right/left at the same time, it made sense to me at the time. The technique is from Ann Peterson’s Craftsy class. I did do it on the diagonal instead of as a border that follows straight. I just attached triangles instead of rectangles to the sides. And Ann Peterson did not necessarily address sashing, but again, I just attached it to the corners first. And before these got sewn down, I put the backing and then batting on the back side of the quilt. This image is of the quilt flipped over, the hibiscus Hawaiian print is the original backing, and the blue swirl fabric is right sides together laying on top, with the batting on the very back of the quilt. And then after sewing the first two corners, I had to take a TV break. This was the boring part so I don’t have any pictures of it. I had to take my scissors and trim out all the batting. At this stage, there are two layers of batting on the right side of the seam I sewed above. So with large ginger scissors and some new Havel small scissors that are becoming my favorites. They have long handles, a curve, and I feel comfortable cutting close to the fabric with these. I can’t remember which pair I ordered and I can’t find the email, but these are really nice scissors. I also bought a shorter curved blade seam ripper which I also like, but not as much as these scissors. These scissors helped me to remove the batting from in between the two pieces of fabric on the seam allowance side of the seam. Removing the inside batting is such a pain in the tuckus, but getting this out before sewing down the other two corners was helpful. TV was definitely involved somehow as a distraction mechanism. And then good good pressing! As much as I could press out. Even with the removing of the batting, and the pressing, if you look closely, you can still see sort of a bulge. Then I repeated the process with the other two corners. And, even with as careful as I was to line up the centers, I was a little bit off. For some reason, even with my walking foot, I find the top fabric always shifts lower than the sandwich part on the bottom. If I thought it was the foot and not the user, I would get another walking foot and see where the error is, but geesh walking feet are a little pricy. And then I showed off my non quilted corners on twitter and the like. And then I found this amazing dahlia line drawing online when I was searching for FMQ designs. This is supposed to be a coloring page for 4th of July, but this is absolutely perfect for my quilt. Link following to my pinterest page on it. And I did the blowing up the design by like 200% and tape it together, and then sew holes in the punched out pattern, and then use the pounce to transfer the generic grid of the dahlia to the quilt itself. I forgot pictures of this part during the weekend I did all that. And then quilted the dahlia, and did echo circles of all three colors on the corner quilting and left some negative unquilted spaces between. And during the week that Robin Williams died, I listened to a podcast and quilted the last rows outside the dahlia. Good way to get out grief and confusion to quilt something. The best picture of my quilting I took today. (It is still not that great of picture, actually). The inner circle is the pink, the middle circle is the turquoise, and the outer circle is the purple. And then I had the perfect color binding already picked out, and I mimicked my original piping idea with a very small kicker / flange type of thing. I cut four 1 inch strips, folded them together lengthwise, wrong sides together, and then stuck them directly underneath my binding that I attached from the front (to hand bind). I have done flanges under several borders of my quilt, and let me tell you that 1 inch was just perfect in the right amount of color just popping out for this quilt. I love the affect it gives. I didn’t know I didn’t like piping until I took the piping out of the original quilt. I am glad I put it back together without the cord inside. Maybe that was user-error?? Anyway, I like it now. hand sewing beads to the corners of the new quilting design. I almost wonder what hot-fix crystals would look like on this quilt? I wonder if this is the quilt where I find out how to do them? Right now I am VERY glad I spent the time recreating this quilt. It was a good quilt before, and I think I bumped it up a couple of levels with all the new stuff I did to the quilt. So yes, done is better than perfect, BUT …. Sometimes “perfect” is more satisfying in the end. I will be glad to be able to hang this quilt up on the wall again! Maybe I will even enter it into the regional show we’re having next June. But we don’t get much space for guild quilts, so if my guild mates don’t chose it, I will have to try to get it judged. I really want to enter a different quilt for the regional show however, the red & black kings puzzle quilt. But first the borders. And the boutique items, and the “ghost bunnies” for the NICU kids, and the round robin projects. And quilting and binding and other things! It was never my intent to be ‘blog silent’ for a month & a half. I am starting to let the blank page intimidate me. Excuses are easier to come by now, if I don’t write now, panic may set in and another week will go by without a post. That aside, I have had an interesting month & a half since we last spoke. 1) I got my friend’s Sunshine quilt finished. The week I sent it off, she was away for a few weeks out of state getting treatment. I finally saw the message she left for me two weeks ago, up until now I wasn’t sure if she had gotten the quilt or not. She said it brightened her day. Which brightened my day. I treated the quilt to an outdoor spring tour before sending it off to her. As a symbol of some of our outdoor bike adventures to this place called Cottonmill, the mall etc. And then it was sent away to my old friend! 2) Also missed in the last month, it was MayDay and Christmas all at once, I worked on these projects for me (the hair bows) & for the quilt boutique for the massive multi-guild show happening next June in Kansas City! Someone was tossing the embroidery in the trash and I decided to save it, and make a stocking pocket out of it. I hope someone will buy it. Here’s another look at the stocking in different light. The ribbon flowers never showed up well in photographs. I am learning how to make individual petals & sew them together. I have a few more sets ready to sew, and then I sew them to a set of alligator clips I had already purchased. 3) I sent out my 1.5″ squares and I got some back! 4) I worked on the center of my round robin quilt, going in the theme of pinks & purples. I put like everything in baggies for my next round robin partner and wrote a lot in my journal. 5) I received Daisy’s round robin center. I have already prepared a small snippet for you to see what I am heading toward. I forgot that my applique points aren’t as perfect as they could be, but this was the design I kept thinking about. As a result of on points in EQ7 and some form of block that is cut in pieces, but looks pretty cool in this context. At least I think it’s cool. It’s of a modern feel, that’s for sure. All these fabrics except the background are from my own stash and I used the focus fabric and fabrics she already had in place for the center to pick the right fabrics to add. 6) I started FMQ on my soft scrapitude. I am working in some shiny metallic thread on part of the quilting for the first time. 7) And I decided to make some orphan blocks into a table runner. I don’t have a lot of green based projects, so this was nice to work on! So …. one and a half months of projects, 7 different types of things to work on during that time. Lots of stimulation. A couple of bad days of panic about not posting, but if I waited much longer this list would be 5 times more. I hope you enjoy! You are currently browsing the archives for the Finished Quilts category.